When a man accused of killing a fellow golfer is freed from prison, the release starts a chain reaction of extortion and murder. Leave It to Beaver fans will spot Stephen Talbot (the Beav�s friend, Gilbert) in this episode. Anomaly: Dean Harens is listed as Morgan Riley but is called Riley Morgan several times and Morgan the rest of the time. Posted by daveb, 12/20/2007. Goof: In the scene where Lorraine Kendall leaves her home and almost hits the car of Warren Donner, Donner proceeds to tell Jimmie Kendall �It is 9:30, it is past time you were in bed.� Despite the assertion that it is 9:30 P.M., the courtyard is brightly lit, casting numerous shadows, indicating that the sun is still above the horizon. Submitted by PaulDrake 33, 7/29/2009. + Latest possible LA Sunset, any year: 8:08 PM Local DST. And, in general, the closer one gets to the equator, the more abruptly darkness falls. LA is at 34� N Latitude. Gary Woloski, 9/27/12. Location: Several times in this episode they meet in a park. Later in court Perry identifies this park as Plummer Park and indeed it is Plummer Park located at 7377 Santa Monica Blvd, West Hollywood between Fairfax and La Brea. About 10 minutes into the episode she waits for the man and you can see a basketball court and net as well as some older people playing games on picnic tables. The basketball court is still there and so are the old people playing various games. It�s like a time warp. Posted by Eric Cooper, August 24, 2009. Some pictures here. Continuity Error: In the scene of Riley Morgan's (Dean Harens) first testimony in the trial, there is a long reaction shot of Mason and his client Lorraine Kendall (played by the fetching Coleen Gray) listening intently to Morgan's answers to ADA Bertram Telford (Paul Langton). Some of the tension is undercut by the fact that Harens' face is plainly visible in the upper left hand corner of the screen, above Raymond Burr�s right shoulder. A definite continuity error in out-of-sequence shooting. Submitted by FredK October 12, 2009. Some vidcaps here. 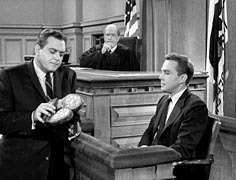 Continuity Error: During the courtroom sequences, Lorraine�s brother Roger McClaine (Ralph Clanton) changes places a number of times. In the longer shots he sits on the aisle just in front of actor Robert Cornthwaite, but in many of the two shots of Burr and Gray he is sitting almost directly behind them. Submitted by FredK, October 12, 2009. Some vidcaps here. Continuity Error: In the scene mentioned above by PaulDrake33, there is also the Case of the Magic Donut. Jimmie Kendall (Stephen Talbot) follows his mother (Miss Gray) down the steps of their home and exchanges some dialogue before she drives away, narrowly missing her brother-in-law, Warren Donner. As PaulD33 mentions, Donner (Hugh Sanders) and the boy have a few more lines of dialogue, leading up to the note that it is 9:30 (though suspiciously light) and didn�t his mother tell him he should be in bed. Talbot replies that his mother told him not to eat so many donuts. To emphasize his words, he raises his left hand to take a bite from a half-eaten donut that has magically appeared there. You can check this out at the 18 minute mark of the latest DVD version. Submitted by FredK October 12, 2009. Some vidcaps here. Sightings: A recurring courtroom spectator, affectionately known as the Little Old Lady in a Hat sits near Roger and then later near Riley. Look at the vidcaps for the trivia entries above. Submitted by gracep, 9/8/2010. + When court reconvenes on Monday morning, Distinguished Lady #2 appears in the front row, as does �Sasha Magaloff.� Behind the Lady sits Quiet Old Man #1. Submitted by gracep, 10/19/2010. + We can furthermore discern the distinctive haircut and profile of Distinguished Gentleman #1 sitting at the bar during a restaurant scene. Lastly, �Sasha Magaloff� also appears in the back row of the courtroom on Friday. Spotted by daveb and posted by gracep, 10/20/2010. + Distinguished Gentleman #1 is the person that finds the body. He is wearing the same suit as his bar scene. We also see Distinguished Lady #4 in court on Perry's side. Bill767, 1/3/16. Della Street (Barbara Hale) does not appear in this episode (despite her name in the credits)! Submitted by gracep, 10/19/2010. + Like most of regulars in TV series Barbara Hale's contract specified she would be credited whether she appeared or not. When William Talman was re-hired his new contract stated he would only be credited when he appeared. In most cases throughout TV history through current series, although the fact that a regular doesn't appear in an episode may be noteworthy, the fact he is still credited is not. Submitted by Wiseguy70005, 3/15/15. + Barbara (b.18 Apr 22, Dekalb IL, 1 of 2 children) appeared as Della 260 times: Wandering Widow was the 1st of her 11 Credit-Only episodes [IMDb]. Mike Bedard 3.14.15. Richard Gaines Judged 14 Perrys from 1958-61; Only 6 of the other 53 actors who Judged PM had more trials [Statistics page]. Mike Bedard 3.14.15. Anomaly: The real name of Casey Adams (playing Burt Stokes) is Max Showalter. Read about this duality in the Credits Anomalies section. Submitted by gracep, 10/19/2010. CARS. (1) 1960 Buick Electra 225 Convertible, Lic UAC 959, light color, top down, Lorraine. (2) 1960 Buick LeSabre 4-Door HardTop, medium color, Warren Donner. (3) Perry's 1960 Ford Galaxie Special Sunliner, Lic No TVC 236, black, top down. (4) 1955 Chevrolet Nomad Wagon, Lic No MTS 916, white over medium, driven by the granny-type at the cabin (Martha?). Same car & plate appeared in Ep#10. Also see Ep#113. The plate number on Perry's '60 Sunliner was "UAR 076" in Ep#99 (the plate was not visible in Ep#98). It looks like the same car in all these appearances but I suspect that it was switched with an identical one after Ep#99. Note also that the plate seen in this episode is next in sequence to the "TVC 235" on the '60 Mercury Montclair of ep#99. We'll continue to see "TVC 236" on this car in later episodes. Added by Gary Woloski 9/20/12. Lewis Creber Prop Art. In the opening scene, Burt Stokes shows the Warden "The Golf Club Murder" article in his "crime DETECTIVE" magazine. The back of Burt's magazine has a full-page ad headed: "TWENTY-FIVE YEARS OLD 250,000 CUSTOMERS T.J. TRITON Corporation". The fictional character "T.J. Triton" was a real-estate magnate and slum-landlord in the 1941 movie ACCENT ON LOVE (see TCM synopsis). Cast includes Osa Massen and Minerva Urecal who had five appearances between them in PM, but not in this episode. If you expand "Cast and Crew" on the TCM synopsis to "ALL" or read this comprehensive AFI Film Catalogue entry, you will find Art Direction credited to Richard Day and Lewis Creber. Creber's earliest film credit is 1930 for Set Decoration on Soup to Nuts. In "ACCENT ON LOVE" the George Montgomery character (John) gets in trouble with his father-in-law, T.J. Triton, when he "omits Triton Realty from an important ad". I haven't found a source for the movie so I don't know if the ad in question resembles the one we see on the back of Burt's magazine, but it's a fair bet that Lewis Creber created this episode's magazine prop. Added by Gary Woloski, 10/12/12. Opening Credit Edit: There is an unusual glitch in the opening credits. Part of the animation of Lady Justice is repeated as it retreats to the background, that is, it become slightly larger then continues to get smaller again. Look for it as the words "In the Case of" appears on the screen. There is also a slight ghostly image when the animation of Raymond Burr begins to move toward the background. Submitted by Wiseguy70005, 4/08/14. Both Dean Harens and Robert Cornthwaite appeared in the third-season episode "The Case of Paul Drake's Dilemma." Submitted by Wiseguy70005, 4/08/14. The Case of the Wandering Coffee Cups: Unless i am mistaken, the final scene is set in the defendant's home and now she and little Jimmie have possession of The Curious Coffee Set -- but the coffee is poured from an old-fashioned metal urn, not from Della's atomic-modern Glass Carafe. Submitted by catyron, 12/7/2017. Take five: Judging by the number of match strike marks on the sidewalk when Burt Stokes left the envelope in Jimmie Kendall's textbook, that scene required five takes. Submitted by Kilo 6/2/2018. This is one of my favorite episodes, with its plot of Agatha Christiean ingenuity regarding the clearing of a convicted murder in the beginning resulting in further consequences of blackmail and murder in the middle and a surprise at the end. Submitted by FredK, October 12, 2009. The casting in this episode has always bothered me somewhat. When I first saw it after some years I was led to expect something completely different. Coleen Gray and Ralph Clanton are supposed to be sister and brother: she a poor but honest secretary who became the boss�s wife and widow and he a man with a shady past. It should be plausible given their actual ages at the time�Miss Gray 38 and Clanton 46. But in the story, Lorraine Kendall is supposed to be about 30, and Clanton, though fit and spry, with his graying, thinning hair could easily play a man some years older. For me the relationship looks suspicious. Maybe someone a bit younger looking such as Casey Adams/Max Showalter should have played the shifty brother, and Clanton should have been the blackmailer. Submitted by FredK, 12 October 2009. Though we get the usual wonderfully alliterative title, in this case the meaning isn�t clear. As far as I can see the widow does no wandering, physical, mental or spiritual. Submitted by FredK, 12 October 2009. + The title may come from the fact that Lorraine�s exact whereabouts were unknown at the time of both murders�that of her husband, six years earlier, and that of the blackmailer, Burt Stokes. This is mentioned to Perry by her brother when Perry arrives at the Kendall home. Submitted by Fifty-Niner, 4 June 2011. To Be or Knot to Be: In the final scene, Perry mentions that he found it suspicious that one of the shoelaces of the corpse (a sailor) was tied in a granny knot. The Kendall boy adds "instead of a square knot!" No one, including a sailor, would tie his shoelace with a square knot, which is not exactly a snap to untie, especially when tightened! Most humans (perhaps excluding some scriptwriters) use the shoelace knot (bow knot) for this purpose. Submitted by francis, 8/30/14. "A square knot: gee Mr. Drake, how come you didn't notice that ?? You're supposed to be the detective. Out of the mouths of babes... Submitted by Notcom, 111815. Tragg is awfully casual about arresting murder suspects. When he showed up to arrest Lorraine Kendall he simply says to her "Mrs. Kendall, if you please" then exits leaving her behind with Perry. Submitted by Kilo 6/2/2018.